I’m in New York right now shooting a documentary vignette to be used in relation to the upcoming documentary WAITING FOR SUPERMAN. It is the first time the director and I have committed to shooting exclusively on the 5D MkII. A few months ago, we rented it to shoot some beauty shots for an industrial freezer gig and ended up shooting the whole thing on it. We realized quickly that the recording of quality sound was a problem. 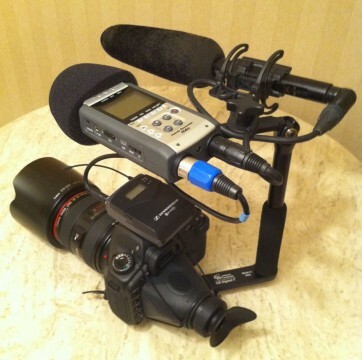 The director, Greg, found a blog entry from Stretch Photography that stated his recipe for getting good sound (and stability) in the documentary world. I had the camera and lens, but nothing else. So we arrived in New York late last night and we went to electronics wonderland B&H Photo/Video this morning to buy what we needed for today’s shoot based on Stretch’s recommendations. It’s a great solution for the typically under-budgeted documentary realm. Stretch’s instructions didn’t work out exactly as he stated so it took some jimmy rigging to make it work out. In his version, the screw that comes with the CB Digital-T Bracket is long enough to screw both the pistol grip mount and the Zoom H4n recorder onto the top of the bracket. As it turned out, the one we bought wasn’t long enough. So, with no time to spare, I found a way to mount the Zoom recorder and the pistol grip mount in a different way that seems to work well enough—using the original screw and knob that came with the pistol grip. Ultimately, I think Stretch’s original arrangement might work out the best; but this will have to do until we can get a slightly longer screw. One thing I think we improved upon was the position of the CB bracket. As Greg and I tried out the new rig, Greg mentioned that he wished the bracket handle was more behind the camera, rather than directly to the side. I had wished that my left hand was more free to focus. Through the course of setting up shots for the day, Greg had the brilliant idea of flopping the mount so the grip was on the right side. This allowed my right hand to hold the camera by the grip and my left hand to live on the focusing ring. I then told Greg that, with this new setup, the major drawback was that the bracket now completely covered the battery compartment—which would make changing out batteries a drag. He then suggested the idea of angling the bracket in such a way that would not cover the battery compartment. I love Greg because he sometimes suggests ideas that he thinks would never work but are actually brilliant! So I repositioned the bracket to free up the battery compartment and realigned the microphones to face forward again and also re-mounted the tripod plate so it, as well, was aligned forward. We then realized we simultaneously fulfilled Greg’s wish to have the hand grip slightly behind the camera! At the end of the day, the rig worked out well and we got some great footage. 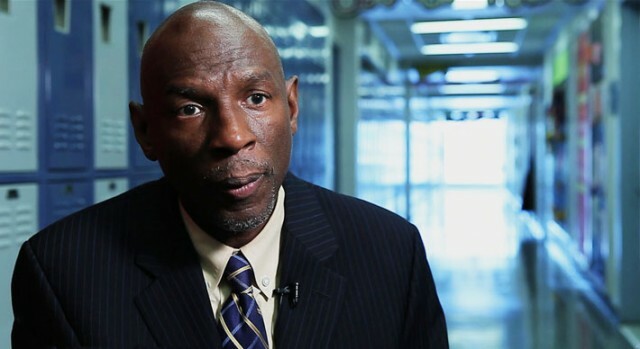 Here’s a frame grab of the interview we shot today of Geoffrey Canada. This was one of the simplest lighting setups I’ve ever done. 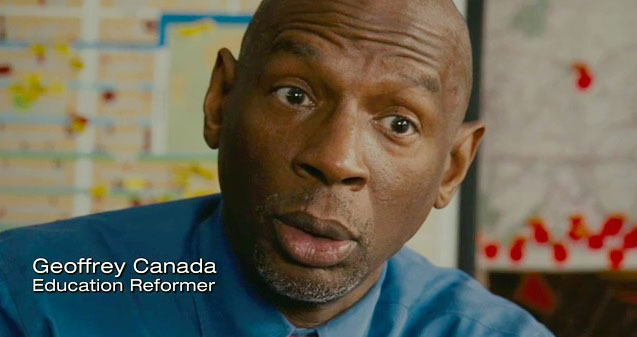 There was one 300W Arri fresnel unit with some 216 diffusion on it as his key light about 4 feet from him—that’s it. I set the white balance to 2800K to give the shot an overall bluish look. Mr. Canada’s skin tone was so warm that it sucked up any of that bluish cast I was trying to put in… but it looked good, so we went with it. This setup was shot mostly between 50mm and 65mm on the Canon 28-70mm lens. The camera was only about 4 or 5 feet from him (very untypical from past shoots). 640 ISO, f5.6 (again, unheard of for us). Usually our shoots with the Varicam or other prosumer cameras, we are set up 10 to 15 feet from the subject and shooting at f1.4 or even as “closed down” as f2.8. I love this camera!